← 10.28.2013 digest is about Eros, Thanatos and cute pets! Those of you who follow my Facebook page probably witnessed a heavy release of Marrakech photos very recently. I thought it would be funny to explain how and why I took those specific pictures and therefore give a bit more context for you to travel along. The problem is that there is no proper narrative structure nor twist so I should just pick some of my favourites and describe them, shouldn’t I? 90% of the photos we see online or in travel logs, show old people with missing teeth or children barely walking, often taken from a distance with a tele lens and I just did not want to add mine to the stack. Because you will quickly realise that if Moroccan people are so excited about you and your camera, it s most often because they can ask you for money once the pic is on the film. Well… For every rule an exception! 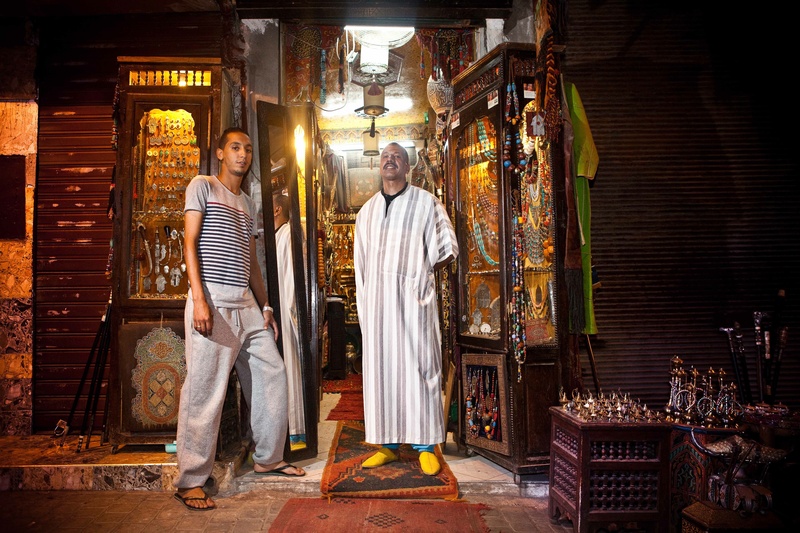 After negotiating fairly heavily with this shop owner (Mind you! Starting at 1200dh for one silver talisman, down to 600dh for two talisman and we got the deal!) I told him I could take a profi fotograf of him in front of the shop and sending him as a present for excellent deal. It was done using a flash held on camera left and dropping down the ambient light for about -1. This was my only proper portrait in a week. We arrived in Marrakech on the Aid El-Adha’s week (I would gently redirect you to Wikipedia to get more info about meaning and significance). One thing to retain is the exaltation feeling pouring down the city during the festivities. And the rays of joy bathing Marrakech that day, were very certainly carried on to the people through the sunlight! The Aid El-Adha is no street festival but rather a family celebration. So everything is happening behind closed doors. 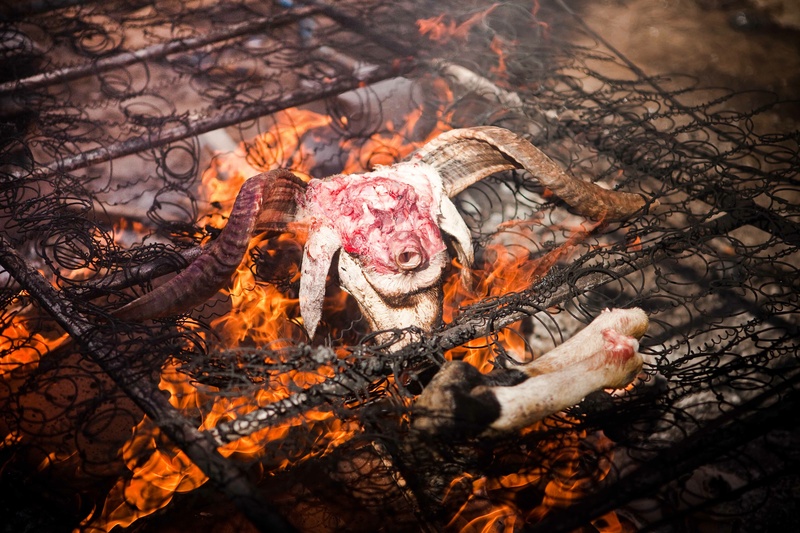 Almost everything… Once the sheep killed behind the walls, the head and legs are given to the children in charge of the grill. This latter will shine in the street, in front of the houses because it s damn smoky and as a way to show to everyone that the celebration is over in this specific house. For strangers, it frankly looks like sceneries of apocalypse at a first glance… But one can quickly realize how happy and proud the children can be for being responsible of the evening dinner! 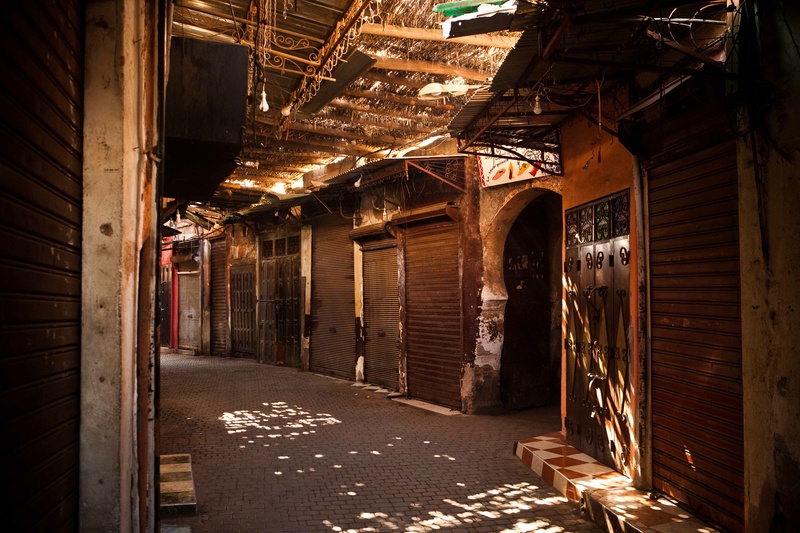 During this specific day, the souks will be left empty and all shops closed. Quite an unique opportunity to take pictures of a place that can be completely overcrowded and sensually overwhelming! The challenge here is about making the right spot choice and picking the right exposure setting to maximize the huge dynamic range of those splendid sceneries (difference of luminosity between the darkest and the brightest spot in your frame). My tip? Take your time and if you use digital: experiment! In reality, this place was not as “warm” (light not being so yellow), but adjusting the white balance I this direction was much more convincing to communicate the mood of this place through a photograph. For the picture below, the colors look pretty much the same as in reality under full bright sun. By choosing my white balance wisely for every picture I can therefore bring coherence to the whole set, conveying this sense of warmth one can feel everywhere in Marrakech in October! My intention for this following shot, my intention was also to convey both the contradictory feelings of contrast and harmony that colours the town. Contrast of modernity/tradition, rectitude/unbalance in geometry contrast due to hard light and saturated colours and harmony within the complementary colour palette. 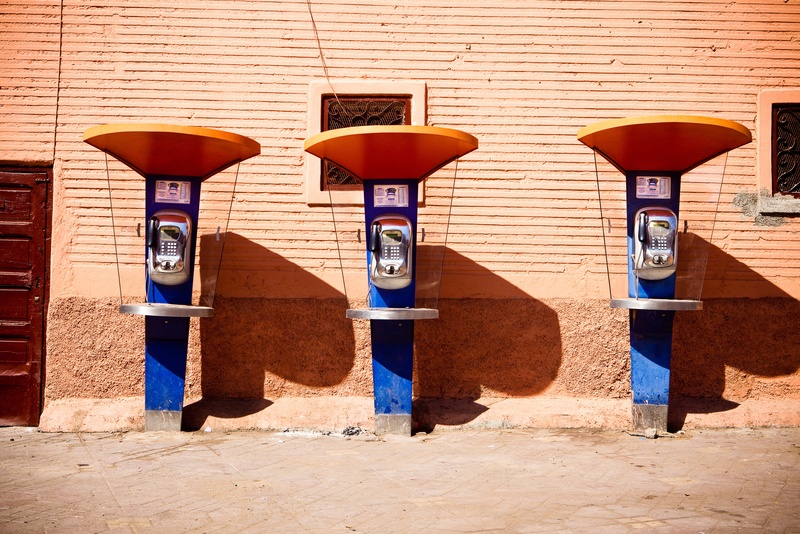 This motive sums it all up for me: 3 telephones in front of a mosque. I hope this set is inviting and thoughtful to you and that my enthusiasm for Marrakech teases your curiosity and travel envies. This entry was posted in photography and tagged Aid El-Adha, BTS, Facebook features, festival, fire, fotograf, god, Islam, Maroc, Marrakech, Moroccan people, Morocco, Muslims, party, Photograph, Photography, red, reportage, travel, trier. Bookmark the permalink.